HOW DOES FLUOROCARBON WORK WHEN TIED TO NYLON? Many anglers fish nylon leaders with fluorocarbon tippets. As with using straight fluorocarbon, knots are more difficult because the fluorocarbon is stiffer and does not draw tight as easily as nylon. 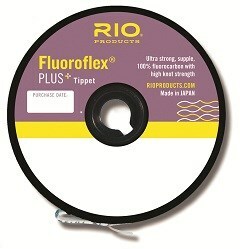 RIO Fluoroflex Plus works just well with nylon because it is more supple and if knots are carefully tied, wetted, drawn tight, it will hold up to big fish! Shop Staff Notes: RIO’s tippet material is top-notch. (As is all their products!) 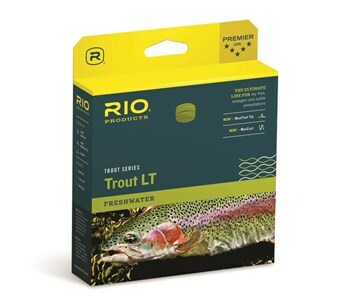 Our staff usually uses Orvis products but we all have no problem using RIO and what’s nice is that RIO and Orvis are very compatible with knotted to each other. I would feel confident with both RIO and Orvis tied to my fly when a big brown inhales my bug! Sometimes it’s a matter of what plastic spool you like to use. (RIO and Orvis don’t click into one another so it’s easier to stick with one brand over the other.). 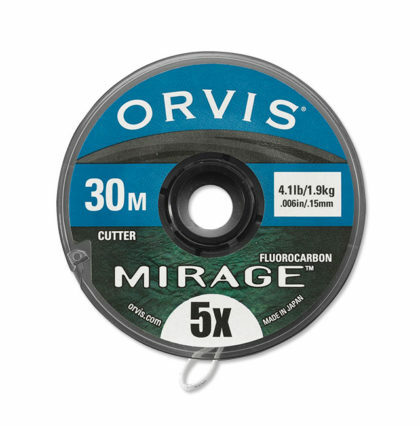 Orvis Mirage is on a 30-METER spool (RIO is 30-YARD spool) which does technically make it slightly cheaper per foot but that’s not a great reason to pick one over the other. Just about everyone on staff preferred fluorocarbon tippet over nylon for most of our fishing on the MO. The added cost is well worth the added stealth and abrasion resistance.